Hey guys, I had SO many requests here on the blog and through social media asking for the DIY Bed Canopy tutorial. 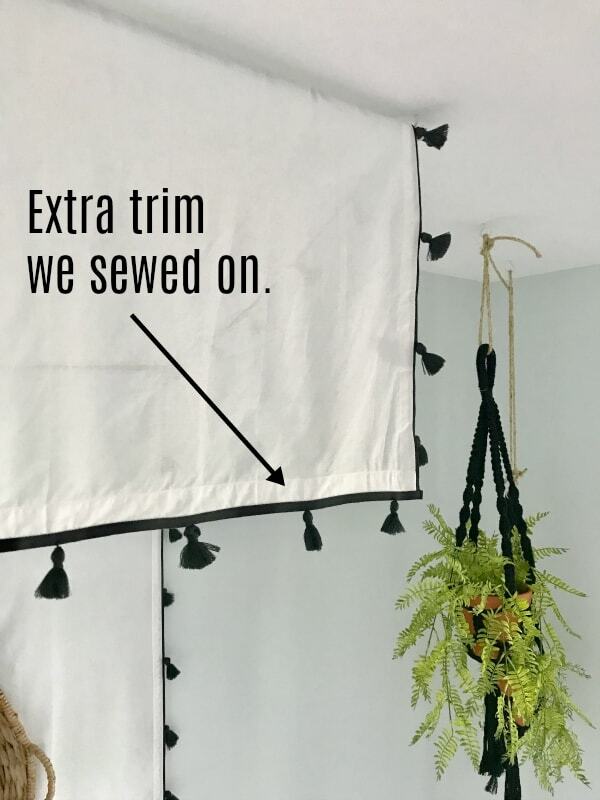 So, instead of my normal Friday Feels ramblings today, I thought I would share the super easy way we made this canopy. I used 2 drapery panels from PB Teen because I love the cute tassel trim on them. I figured it would be easier to use ready made panels vs. having to finish off the edges of fabric. If you wanted a specific pattern or fabric you could totally use anything you want and just cut it to the size of your bed and finish the edges. 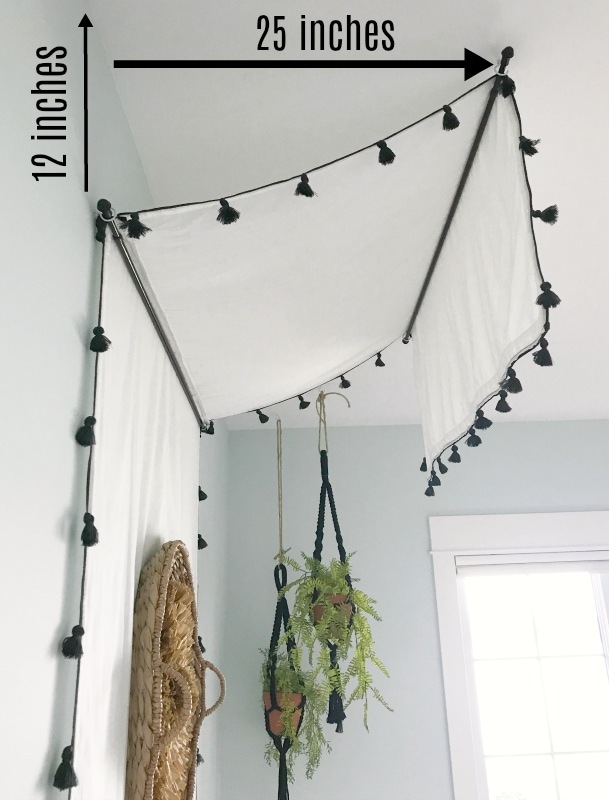 PB Teen was sold out of the longer drapes when I wanted to make this, (they are back in stock now) so depending on your ceiling height you could even get away with one of the longer panels possibly. I used 2 84 inch panels. 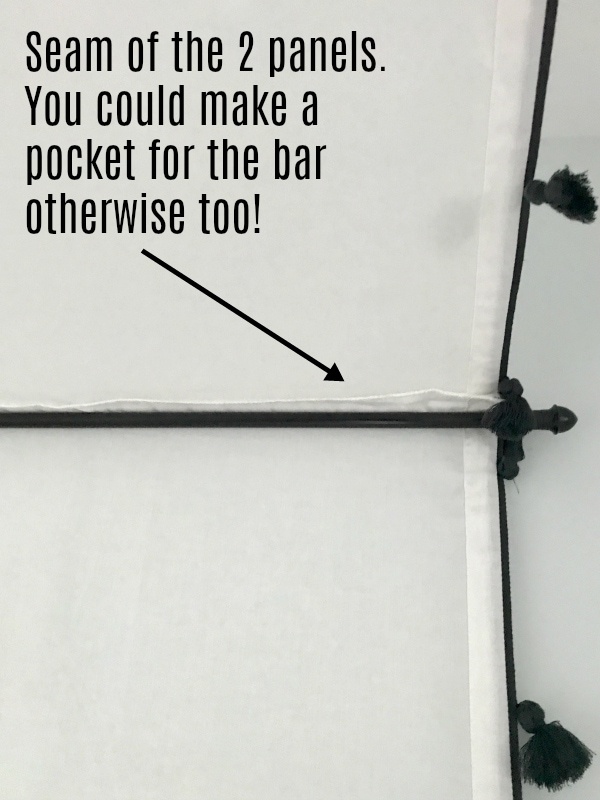 We figured out where we were going to hang the bar on the back wall so we could hide the seam behind the bar, rather than have a visible seam where it hangs down. Our ceilings are 9 ft and we hung the bar 1 foot down from the ceiling. I bought 2 of these lightweight $8 black drapery rods from Target, and a package of these little white hooks that just screw in. Make sure you get hooks that are big enough to accommodate the size of the bar. This is so easy guys! I measured 1 ft down from the ceiling and then the width of the curtain panel is 44 inches. So I placed the hooks just a bit outside of where that would be, marked it with pencil and screwed the hooks in. Pop the bar in and done. Next I decided how far out I wanted the canopy to go, you could do any distance you want. I decided on 25 inches because of where her light fixture hung over the bed. So same thing I measured 25 inches out plus a little wider than 44 inches, marked it with a pencil and screwed the hooks in. Place the bar again and you are done. The next step required the Mr.’s help. We carefully pulled the canopy behind up and over the bars, being careful not to knock them down (ok so we knocked them down like 3 times, but eventually we got it up there). The tassels on the side are keeping the fabric from slipping, but I think if you sewed a pocket for the back bar on the wall to slide through that would keep it in place better. I may do that down the road for more stability if my daughter messes with it, but so far it has stayed put. I’m guessing the fact that there is a nail through the fabric holding the basket up is helping too. 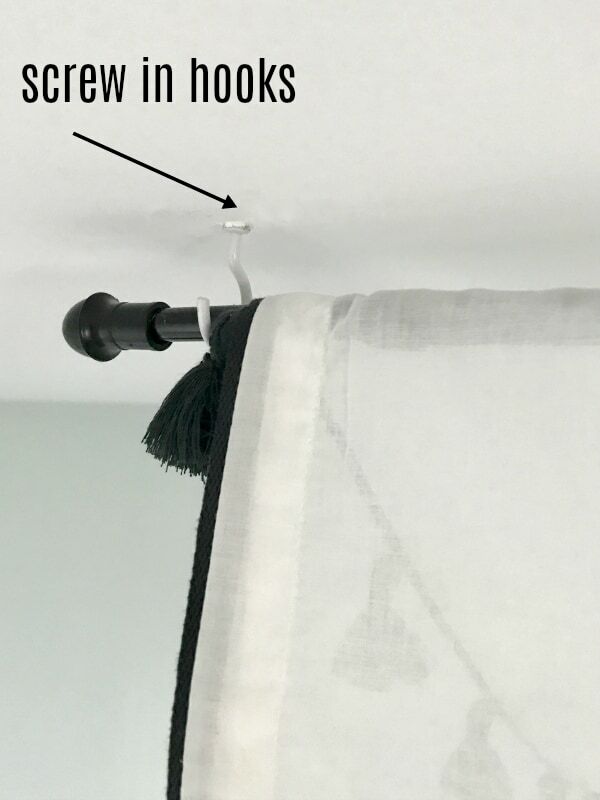 Because we had extra material left from the 2 curtain panels, we removed the tassel trim from the extra piece and my mother-in-law sewed it across the bottom of the fabric that would hang down. You could use any trim you find to add to a different fabric if you go that route. Huge thanks to my mother-in-law for helping me with the sewing! 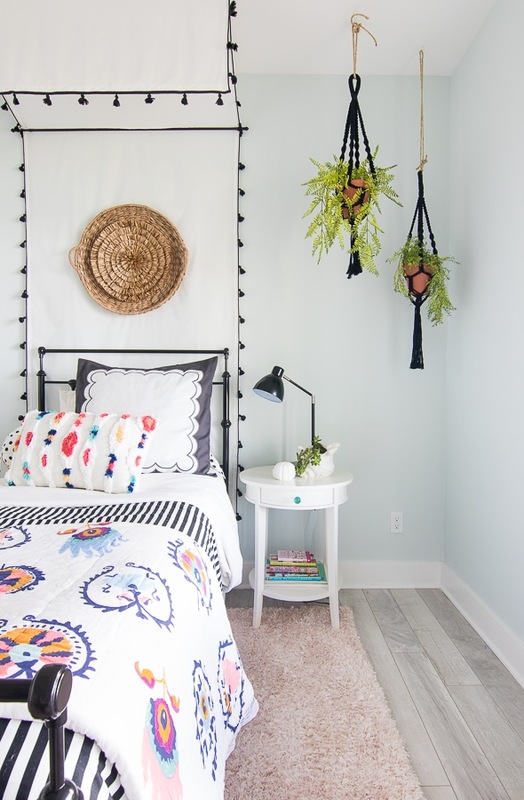 To find the complete shopping source list for her room, you can see the full room reveal here. All the sources are linked at the bottom of the post. Happy Weekend! Such a great idea! I love your DIY tutorials . Thanks Marta! Have a great weekend! Thanks Dori, it’s such a fun addition to the room! Oh how I bet she loves her room! 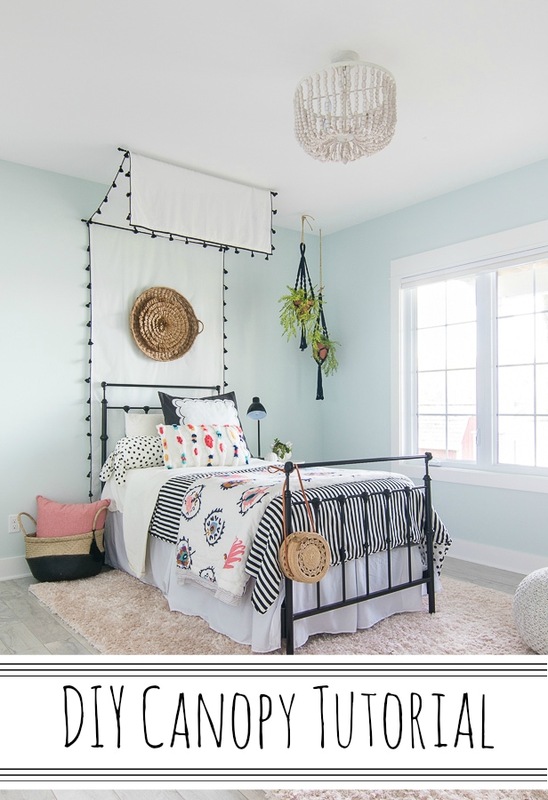 I’m also taking inspiration from the color palette – the flooring and walls with pops of white / black, for my own bedroom. 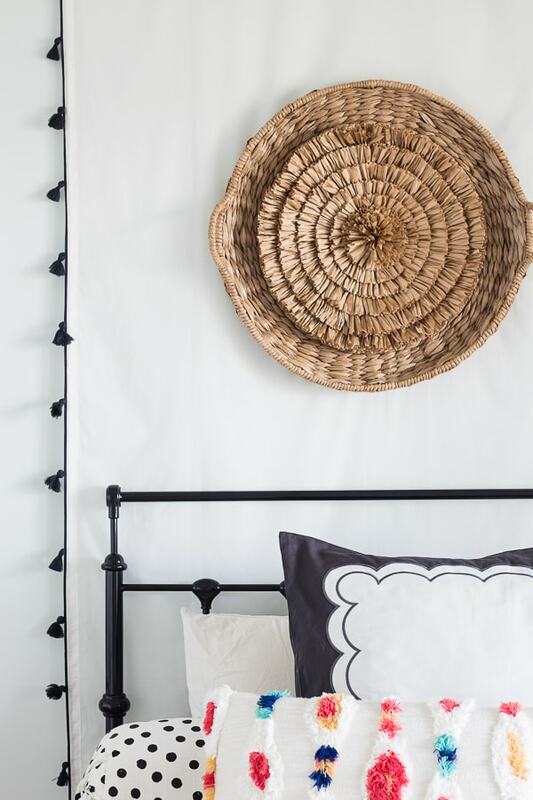 Still doing the “pinch me” thing but we just purchased a beach place, so I need coastal decor ideas. Could you please share the wall color and flooring (brand / color) as they are exactly what we’re talking about. Thanks so much, Ahoy! The canopy is adorable! Tassels are my favorite! You are a good momma to accommodate all her requests for a new room. Not an easy task. What if you used double stick tape on the rod to hold the fabric? Ive had to use for curtains when I wanted it to stay in place. Oh that’s a great idea! Thanks for the tip! We’re did you get her bedding?? ?